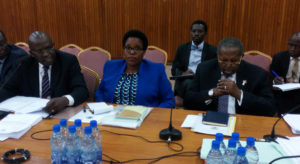 Bank of Uganda governor Tumusiime Mutebile (right) and other officials appear before MPs yesterday. Photo by Vincent Kasozi. The Parliament committee overseeing statutory enterprises has raised concern over high legal bills incurred by the Central Bank. The committee chaired by Abdu Katuntu yesterday admonished Bank of Uganda officials for contracting private legal firms at exorbitant costs. The officials were led by Central Bank governor Emmanuel Mutebile. The fees incurred by Bank of Uganda total to over Shs1.3 billion over three financial years ending June 2017. This is excluding Shs1.5 billion paid out this year alone. Katuntu wanted explanations as to why external lawyers were contracted for what he termed as elementary legal duties. “We find it quite unacceptable that even placing a caveat on a property you have to run to an external lawyer to do It,” he said. Documents presented by BoU to the committee show that Tibeingana and Company advocates were paid Shs20m in the FY 2015/2016 for conversion of the bank’s land at Block road, Kiira road Plot 4 in Jinja to freehold. The same firm was paid over Shs51 million for the conversion of leasehold land to freehold in Arua the previous year. According to the documents, other legal firms contracted by the central bank during the period indicated above were MMAKS Advocates, Ligomarc, Kateera and Kagumire advocates, Bamuite and Kakuba advocates, AF Mpanga advocates, JB Byamugisha advocates, KMT advocates and Impala legal advocates and consultants. The bank officials return to the committee tomorrow to provide detailed responses to specific cases handled by the external lawyers.